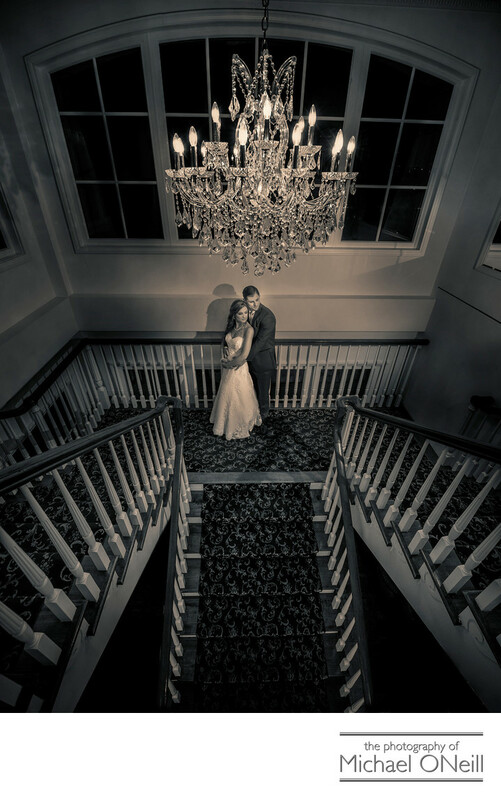 There is something about a grand staircase that just lends itself to elegant and dramatic wedding pictures. I love working at venues that offer these beautiful surroundings. Sometimes it could be at the luxury NYC hotel that the bride is getting ready at. Sometimes it is at a location that the bride and groom have chosen for their formal wedding portraits. It could be at an outdoor location such as the stairs leading into Bethesda tunnel inside New York City’s Central Park. In this particular photograph the staircase was located inside the bride’s wedding reception venue, Lombardi’s on the Bay, located on the Patchogue, Long Island waterfront of the Great South Bay. Executing a shot such as this one requires special photography equipment and the use of above average photography skills. A super wide angle lens is being used on a tripod mounted camera from a position above the wedding couple. A skilled photographic assistant is off to one side (camera right) handling a radio-controlled off camera electronic flash to illuminate the subjects. The tricky overhead angle, coupled with the use of a wide angle lens requires critical camera positioning to avoid distortion. Just the right exposure had to be chosen to make the parking lot beyond the window at the top of the picture invisible, while maintaining the lights in the crystal chandelier to be seen in their illuminated state. Finally, to achieve this authentic vintage looking selenium toned color, above average skills in digital post production come into play.